chicken spaghetti | Frozen Pizza, Again? I had never heard of chicken spaghetti until we moved here. The first time I had it was at a church fellowship soon after we moved in, and from that day I’ve been a fan of chicken spaghetti. And who wouldn’t be? It’s cheesy with pasta and chicken and a little kick from the Rotel. Yum! Now technically this dish isn’t called Chicken Spaghetti, but it’s pretty much exactly like the dishes that have been served to me as chicken spaghetti. 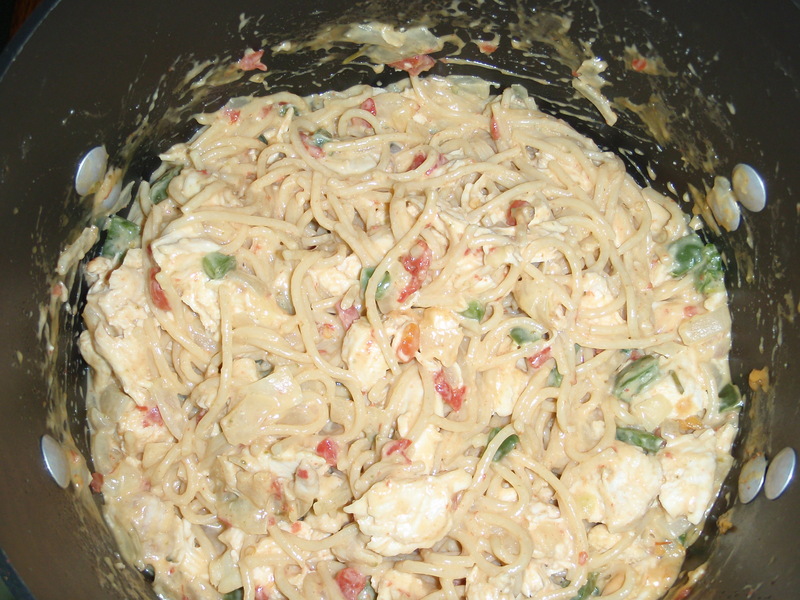 I’ve seen other chicken spaghetti recipes on the internet that involve cream of mushroom and cream of chicken soups. Those sound more like my mama’s chicken tetrazzini than chicken spaghetti. The only major change to the recipe I made is not putting it in the oven. The original recipe said to transfer the contents of the pot into a casserole dish and bake for 30-40 mins. My pasta was ready to eat after all the ingredients were mixed in and I saw no point in sticking it in the oven, especially since the cheese was already melted. 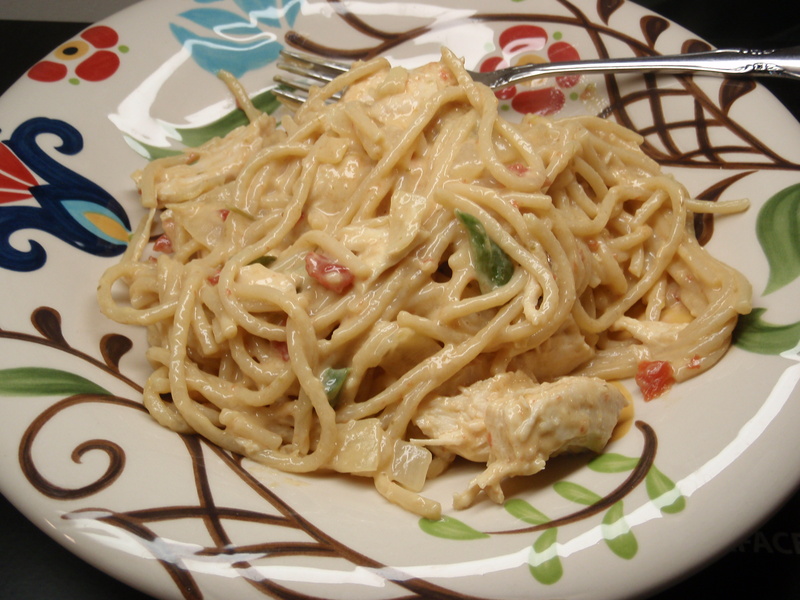 If you’ve never had chicken spaghetti before, you are in for a treat! We really enjoyed this dish; Russell even told me it was “really good!” before I asked him his opinion! Boil chicken breasts in water in a large pot (I used a 5 qt chili pot). Save 3 ¼ cups of the chicken broth for cooking the spaghetti. While chicken is cooking, sauté the pepper and onion in butter until soft. Remove from heat. Remove the cooked chicken from the pot, and set aside. Drain chicken broth, reserving 3 ¼ cups for the spaghetti. (I poured the liquid through a mesh colander into a measuring cup to remove any “impurities.” After I emptied the pot I rinsed it before reusing it.) Cook the spaghetti in reserved chicken broth, according to package directions. Once spaghetti is cooked do not drain. Reduce heat to medium. Add Ro-Tel and Worcestershire; cook until liquid is mostly absorbed. Cut the Velveeta cheese into small cubes and add to pot; stir until melted. Add the pepper and onion. Tear the cooked chicken into bite-size pieces and add to the spaghetti mixture. Salt and pepper well (optional).